As I move towards retirement, I am no longer looking for new projects and am now just finishing off some long-standing commitments to existing clients. I would like to take this opportunity therefore to thank all of my clients and colleagues, both past and present, for their help, encouragement and support. It is nearly 20 years since I set off down the route of independent consultancy and, whilst sometimes it has been challenging, it has always been good to know that there were people out there able and willing to support my efforts and to share the problems. It's been fun, I've learned a lot (such a lot!) and have enjoyed sharing in the successes along the way. I doubt if I will ever entirely retire however, so I would always welcome contact from any fellow novel crop or speciality oil enthusiasts out there and if, on the basis of 40 years experience in the field, I can help with your particular problem, I would be happy to consider it. Just drop me an email (address on my contacts page). All the pages of the site are accessible through the menu at the top of each page. In particular, full text of all my publications can be accessed through the chronological listing in the publications section. If you are looking for some specific information it is worth searching for particular keywords using the search box at the bottom of this page as it limits Google to searching just on this site. Not all pages may have been indexed so I have also provided some links below to topics which might be of interest. Much of my experience over the years has been on the development and production of evening primrose seed and oil for the healthfood and pharmaceutical industry, and so there is a great deal of information about this fascinating crop. The uses (and potential uses) of evening primrose oil in the pharmaceutical industry (1999). A more technical treatment of the same subject, with information on the development of the evening primrose crop (1993). An evaluation of the market for GLA-containing oils, including evening primrose and borage (2000). A review of Chinese research, cultivation and use on evening primrose. China produces around 90% of the world's supply of evening primrose oil (2001). An insight into the development of evening primrose oil as a pharmaceutical product (1993). Oxidation in evening primrose oil (2000). Commercial factors affecting the development of evening primrose crop production (1992). An early description of how the evening primrose crop was domesticated (1982). 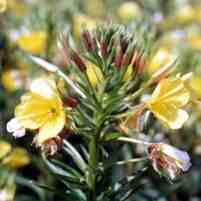 The problems which had to be overcome in domesticating evening primrose (1999). Evening primrose growing trials in Pakistan (1998). Fatty acids - where they come from and why they are important (2000). A really cool animated diagram of the pathway showing how the fatty acids are made in the body. You need the CHIME plug-in (free download from here ), but it's well worth the effort. (2001). Other oils containing GLA (2000). GLA can be produced using Genetically Modified Organisms (GMOs) (1997). Technical description of the isolation of the gene for making GLA (1997). A comparison of evening primrose oil with borage oil (1993). 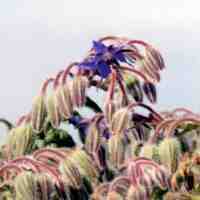 How the borage crop was domesticated (1999). Factors which affect the commercial viability of new crops (1989). New crops and European subsidies (1992). New crops and agrochemical usage (1992). General principles for the development of novel pharmaceutical crop plants (1993). Oil crops for the pharmaceutical industry (1993). The attitude of the pharmaceutical industry to crop-derived raw materials (1993). Obstacles to pharmaceutical crop development (1998). Breeding dwarf runner beans (Phaseolus coccineus) as a protein crop (1979). Production of dyes from traditional crops (written by my co-authors) (1997). How to build a flotation machine to find the remains of crops grown by ancient civilisations (included just for fun) (1974). Click on one of the flags above for a machine translation of this site, or here for other languages.